FREELANCER CLUB "THIS FREELANCER LIFE"
Sharing my thoughts on my freelance career with the good folks at Freelancer Club. 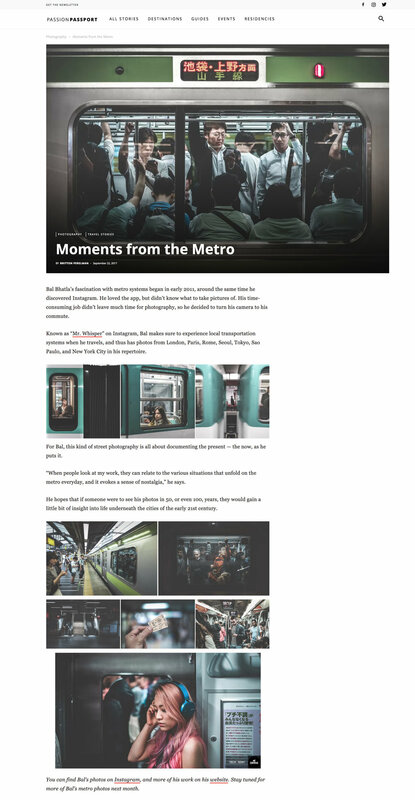 Did a quick Q&A with the lovely peeps at Passion Passport about my Metro photography from around the world. VANITY STUDIOS "12 INSTAGRAMMERS YOU WON'T REGRET FOLLOWING"
Very proud to be placed along such a talented bunch. Check it out If you've got a spare moment. Freelancers Club "INSPIRATIONAL FREELANCER - MR WHISPER, PHOTOGRAPHER"
The London Egotist "Mr Whisper Goes Rogue in London"
Did a little Q&A about my photography and stuff with the good folks over at Making Pictures. Check it out if you've got a spare 5 mins. Have a great weekend all. Truly Experiences "10 Best London Lifestyle Instagrammers"
Evening Standard interview "Why every Londoner should follow mrwhisper"
Super chuffed with my second feature with the Evening Standard. This time online with and a little interview. If you've a spare few minutes you can check it out below or here. ES Magazine's "Top 5 Instagrammers"
So hyped about this little feature in Friday's Evening Standard mag. I made their top 5 favourite London Instagrammers list. Huge thanks ES mag. Hand Picked "Instagrammers you should follow If you love London"
The Idle Man "Mr Whisper chats to The Idle Man"
Vodafone blog "iPhone 6S vs DSLR:Instagrammer @mrwhisper's amazing London skyline photos"
The Goodweb Guide "Quintessentially Travels Top 5 Instagrammers"
Matador network "15 Instagrammers killing it in London right now!" Samsung - Speak Pictures website "Introducing Mr Whisper"
Foto-Ruta "Top 10 London Instagrammers"